In a plastic bag, combine chicken and 1 c. BBQ sauce. Seal tightly and refrigerate for at least an hour. Remove chicken from bag, discard marinade, and grill chicken on BBQ grill until cooked through. Use remaining BBQ sauce to slather over chicken while grilling. Remove from heat cut chicken into slices of cubes. Set aside. In a large serving bowl, toss romaine with corn, black beans, and green onions. Top with shredded cheese and tortilla chips. 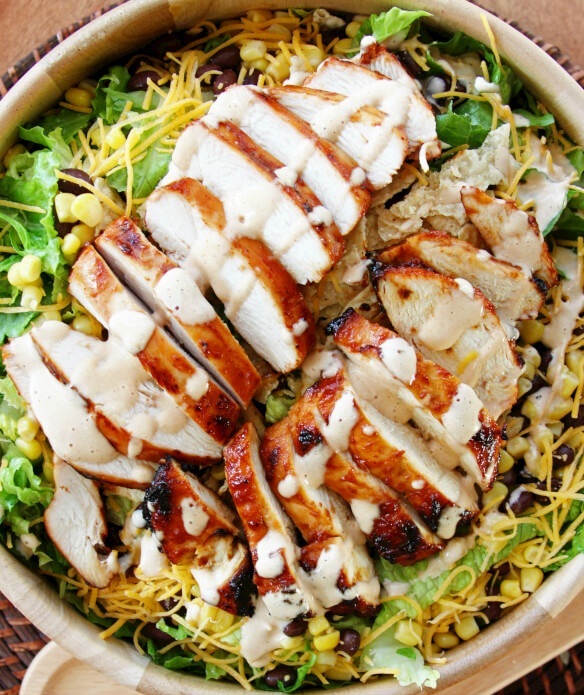 Serve with Creamy BBQ Dressing (See below). For the dressing, combine all the ingredients together and whisk vigorously to combine. You could also run this through a blender to make it even more smooth. Refrigerate until ready to serve.